As the largest vacation rental company on the Outer Banks of NC, Sun Realty is proud to represent a wide variety of quality beach homes. We offer OBX accommodations from Carova to Hatteras Village, owned by wonderful families just like yours. Each village and town along the Outer Banks adds its own unique appeal to the area. Some areas will put you in the middle of everything, thriving with restaurants, shopping, attractions and family-friendly entertainment. Other areas are more secluded, yet still provide dining, shopping and exploring - just in a more peaceful setting. The Outer Banks allows guests to customize their beach vacation by choosing what area best fits their vacation needs. No matter where you choose to spend the nights of your vacation, you will always be within a quick drive to another town, new scenery and various attractions during your stay. The Northern Beaches of the Outer Banks are a widely sought after destination. These beaches are home to the villages and towns of Carova, Corolla, Duck and Southern Shores. The Central Beaches include the busier towns of Southern Shores, Kitty Hawk, Kill Devil Hills, Nags Head and South Nags Head; while the Southern Beaches of the OBX refer to Cape Hatteras and its many villages. The Southern Beaches are known for spectacular water sports, its laid-back island setting and the Cape Hatteras Lighthouse. 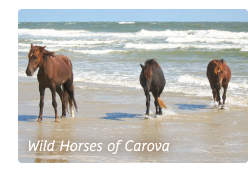 Carova & the 4x4 Beaches: If you are ready for a true adventure, the 4x4 beaches of Carova are for you. There are no paved roads within this area and you must have a four-wheel-drive vehicle to access the vacation homes. With a bit of luck, you'll catch a glimpse of wild Spanish Mustangs, North Carolina's state horse, grazing or playing in the surf. Corolla: As the most recently developed area on the Outer Banks, Corolla boasts desirable planned communities and many upscale vacation homes. Enjoy wide expanses of beach, fantastic restaurants, unique shopping and historic sites such as the Whalehead Club and the Currituck Beach Lighthouse. Duck: The charming town of Duck, NC offers quaint shopping and dining, a gorgeous sound front walkway and town park, beautiful beaches, and an abundance of family-friendly entertainment. And with some of the most pet-friendly beaches on the Outer Banks, Duck is fun for the whole family! Kitty Hawk & Southern Shores: These conveniently located areas are the first towns you encounter after crossing the Wright Memorial Bridge, if you are traveling from the north. Enjoy close proximity to shops and restaurants, as well as miles of breathtaking coastline. Much of the areas in Southern Shores and Kitty Hawk offer low dune lines, which translate into stunning ocean views from your vacation rental. Kill Devil Hills: Be in the center of the Outer Banks in this vibrant area! Take advantage of the wide-variety of shopping, dining, souvenir shops and family-friendly activities while vacationing in the heart of the OBX. This centrally-located town offers easy beach access, public sound access and ample parking. It is also home to the Wright Brothers Monument and its National Memorial. 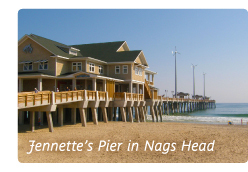 Nags Head: This quintessential beach town has been attracting vacationers for over 150 years and some vacationers even refer to the entire Outer Banks as "Nags Head". Stay in a historic "Old Nags Head style" cottage or a newly constructed home with the latest amenities. Pull yourself away from the beautiful beaches to climb Jockey's Ridge State Park, the largest living sand dune on the east coast, or make plans to shop the day away in nearby shops and outlet mall. South Nags Head: Bordered by the Cape Hatteras National Seashore and the Atlantic Ocean, this tranquil area offers little traffic and pristine beaches. Walk, jog or ride your bike along the multi-use path, or simply enjoy captivating views of the Atlantic. 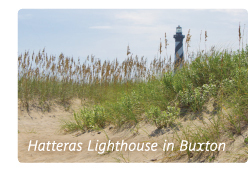 Be sure to take a short drive down HWY 12 South and visit the Bodie Island Lighthouse and Cape Hatteras. The Tri-Villages of Rodanthe, Waves & Salvo: The unique atmosphere and stunning natural beauty of Hatteras Island is unlike anywhere else. Home to secluded beaches, dense maritime forests and coastal charm, the first three villages of Hatteras Island are charming and small. These areas are a haven for fishermen, surfers, kiteboarders and wildlife enthusiasts. Settle into the Hatteras lifestyle while vacationing in these villages: flip-flops, good food and a laid-back attitude! Avon, Buxton, Frisco & Hatteras Village: These four areas are the southern-most villages before having to take a ferry to Ocracoke Island. While each area offers secluded beaches and dense maritime forests, they are also home to the Cape Hatteras Lighthouse, unparalleled coastline, world-class fishing and one of the best windsurfing spots on the planet. Find Your Next Outer Banks Vacation Rental Today!